I am an absolute animal lover. Kevin can’t even watch an animal based documentary with me anymore because I get so excited and can’t stop repeating “he is so cute!” the whole time, which, as he has so kindly put it, “ruins the show.” In any case, nearly every dog I have ever encountered easily wins over my immediate unconditional love. That is, until I was constantly chased by the ferocious looking sheep herding dogs here in Georgia. Dogs think of us cyclists as highly as they think of the mailmen, which unfortunately means that we are constantly being chased and barked at in countries with free roaming dogs. Sometimes, like in the case of the gigantic sheep herding dogs, it’s because they are doing “their job” of protecting the flock (it seems that no matter how many times we tell them we aren’t here to steal their sheep they just don’t understand) whereas other times we get chased because the dogs are scared. And sometimes, we end up in this high speed pursuit simply because dogs seem to have an issue with turning wheels. In any case, it’s extremely scary to be chased and barked at because you never know how the unpredictable animal will react. I was once bitten in South America (on the one day I rented a bike down there) and Kevin got bit just a few months ago in India (while walking) so we are both wary of the consequences. This dog problem is pretty universal for cyclists, and a common conversation from one cyclist to another often looks like this: “Look out for the dogs in Uzbekistan, they come charging from miles away when they see you!” I have created another dog problem for myself as well, though this one is infinitely less scary. I now have now fallen in love with over a dozen dogs though, inevitably, I have always had to bid them farewell at some point or another. 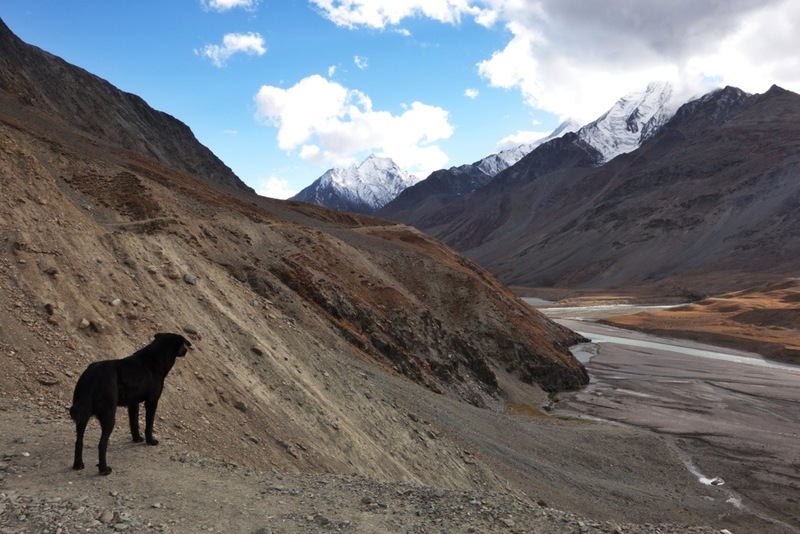 There was Max, the Indian shepherding dog who followed me for over a week through some of the highest roads in the world, and shortly after, I acquired my dear Tuffy who also followed me over a week from someone’s home. Both of these dogs didn’t follow me because of the amazing food I was giving them (unfortunately they only received plain bread and rice as I had nothing else) but because, unlike everyone else around them who constantly hit them with rocks, I was kind and played with them like any human should. Since then I have had a spattering of other dogs for the night, and most recently, I found myself a beautiful gentle giant (one of the Georgian sheep dogs who now lives at a picnic site) who I so wanted to bring along with me. This entry was posted in Georgia and tagged Cycling around the world, cycling problem dogs, dogs in georgia, dogs in india, why dogs chase bikes by The Wandering Nomads. Bookmark the permalink. I am totally speechless about your travels. Your all pictures are just wow!! Excellent and I love reading your stories. It’s great to see such well presented blog. Lovely. You sent me a request to fill out a poll about your readers, only when I clicked the link it didn’t show up, it sent me to an “OOPS” page. Thought you’d like to know. But for the record, I am Tina Welsh’s mother’s friend, 62 yr old, living in Rio Rancho NM, and I also travel and blog about going solo. I’m so impressed with you and what you’re doing, it’s way more adventure than I was up for at your age. More than I’m up to now I’m afraid, but I do enjoy going place many others wouldn’t go out of fear, and that’s huge for me. It’s just too much fun to pass up in the one life we’ve all been given. You’re making the most of yours and that spirit will infuse your attitude your whole life.